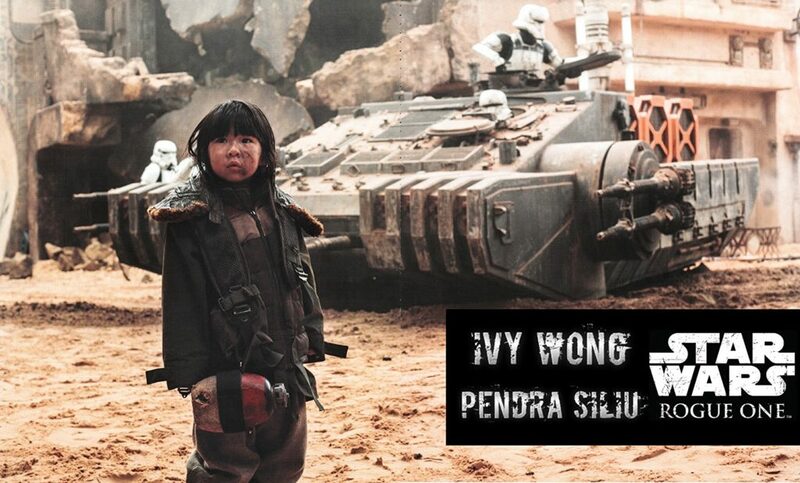 Ivy Wong played Pendra Siliu in Rogue One: A Star Wars Story. 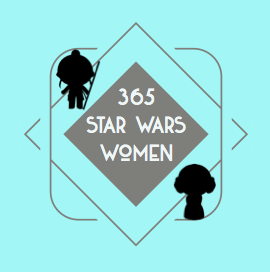 Ivy and her father Mark were kind enough to answer a few questions via email for 365 Star Wars Women. Ivy, what was your introduction to Star Wars? Had you heard of Star Wars before you were cast as Pendra Siliu in Rogue One? I know you were just three years old at the time! IVY: My dad has got a lightsaber toy at home and he told me it’s “Star Wars”, but I had not watched any Star Wars movies before (before filming for Rogue One). I still remember I was at Pinewood Studios filming for Rogue One. Then, The Force Awakens came out. I was very excited because my parents took me to watch it. It was the first time I watched a Star Wars movie at the cinema. It was so amazing and I really enjoyed it! What Star Wars movies, TV shows, etc. have you now seen and do you have any favorite characters? IVY: I have watched Rogue One, all episodes (1-8) and Solo. I really like Star Wars Rebels and I absolutely love playing Lego Star Wars: The Force Awakens game on PlayStation with my little brother Hugo. I have also watched a few episodes of The Star Wars Show on YouTube. My favourite Star Wars character is Pendra Siliu LOL, because it’s me! I love Jyn Erso as she is super cool! She was playing with me in a scene and she also saved my life back on Jedha. I also really like Rey and BB-8. Rey is so strong and BB-8 is just super adorable. Mark, how did Ivy get the role of Pendra in Rogue One? 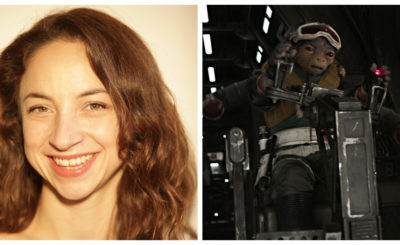 Did you know she was auditioning for a Star Wars film right away? Was your family a fan of Star Wars before Ivy got this role? At the time, we still didn’t know which movie this was. They kept it as a real secret and even used a code name: Los Alamos. We had no idea that it was Star Wars until Ivy told us she saw some “Stormtroopers” after she finished her first day on set at Pinewood Studios, then we realised!!! Ivy’s grandparents are from Hong Kong and they watched Star Wars in cinema when it first came out there, before I was even born. I still remember how my father was telling me all of the storylines and I was just stunned when he told me that Darth Vader was the father of Luke Skywalker, what a twist! I can tell that my father is a bigger Star Wars fan than I am! Unfortunately, Ivy’s grandfather had already passed away before Ivy was born. Though I’m pretty sure that he would be so proud of Ivy if he knew what Ivy has done, although he probably won’t believe it at first. As for me, my favourite character is Darth Vader and his best scene was definitely the final scene in Rogue One. 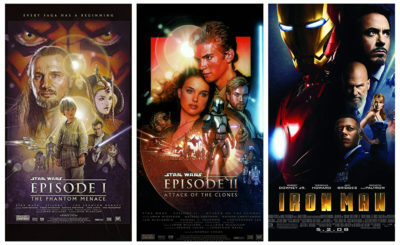 Personally, watching Ivy in a movie that has Darth Vader in it just seems so unreal. Ivy, what do you like about acting? What was it like on the set of Rogue One and to work with actress Felicity Jones? Was it difficult to be so upset for your scene and (I’m assuming) repeating that scene over and over again? IVY: I love acting because it’s good fun. It’s totally amazing when I can watch myself on the big screen with my parents and little brother Hugo. The only downside was that it took over a year from filming before I could watch the actual movie in the cinema. I have been taking drama lessons since I was 3 years old. I currently attend Sylvia Young Theatre School and I have got lots of good friends there. I loved the Stormtroopers and so the crew asked them to play with me in their free time. I really like Felicity Jones as she was playing with me when we were waiting on set. I remember having jelly beans candies and did some drawing while we were waiting in the trailer (waiting room). Mark, how long did it take to shoot Ivy’s scenes for Rogue One? 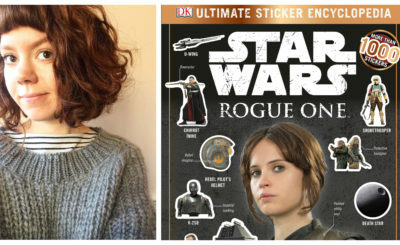 Was everything Ivy shot for Rogue One used or was she in any other scenes that got cut out? MARK: Ivy was only 3 years old and due to age limit, she was only allowed to be on set for a maximum of 5 hours per day. Ivy went for about a week in total, split between October and November 2015. This particular scene was done in two parts. First half of the scene: there was a lot of noise due to the tank and people running around the set and shouting. Ivy got very scared and so she cried. Then she was taken off set. Second half of the scene (filmed on a later date): Ivy was supposed to carry on crying, though she couldn’t anymore as she was no longer scared. So the director asked Ivy to “close your eyes and open your mouth” to pretend that she was crying. Then Ivy got rescued by Felicity Jones as the explosion went off. I believe that Ivy crying in the first half of the scene was totally unexpected. But the director must have captured it and really liked it because it was a natural reaction and that it was as real as it could get, so they decided to create the second half to make it a completed scene in the movie. Ivy actually did a lot more scenes but they didn’t make it to the final cut, it might have been due to the reshoot or change of storyline. I saw Ivy has been to a few Comic-Cons since Rogue One. Has it been fun to meet Star Wars fans at these conventions? Who have you been excited to meet or see at the conventions you have been to? MARK: Ivy was invited to attend London Film and Comic Con by Showmasters, MCM London Comic Con and London Film Fair. Ivy loves meeting with Star Wars fans from all over the world. She enjoys doing autographs and taking photos with fans. At London Film and Comic Con by Showmasters, Ivy was so excited to meet with Jason Momoa (Aquaman), Zachary Levi (Shazam), Ray Fisher (Cyborg), Tom Welling (Smallville Superman), Sam Neill (Jurassic Park), Matt Smith (Doctor Who), Ray Park (Darth Maul), Rory McCann (Game of Thrones), Katie Leung (Harry Potter), and Temirlan Blaev (The Last Jedi). And at MCM London Comic Con, Ivy was really excited to meet with Donnie Yen (Rogue One, Ip Man), Warwick Davis (Star Wars), Summer Glau (Terminator: The Sarah Connor Chronicles), and Echo Kellum (Arrow). Ivy is a big fan of Donnie Yen, she loves Donnie Yen’s martial arts movies and is learning Taekwondo. Ivy was also super excited when she got the chance to meet with her favourite Harry Potter’s character – Cho Chang by Katie Leung!! Ivy, have you read any Star Wars books? If so, any favorites? Only the Star Wars Rogue One The Ultimate Visual Guide by Pablo Hidalgo, because I was in it. I had a lot of Star Wars toys when I was a kid. Ivy, do you have many Star Wars toys? If so, what are some of your favorites? As a BIG Star Wars fan myself, I do have lots of Star Wars toys and figures which I love playing with. In particular, I really like my Jyn Erso figure as it was a special birthday gift from Lucasfilm on my 5th birthday. While I love playing with my BB-8 Droid, my favourite are definitely lightsabers. We have got blue, green, and red lightsabers. When we have a lightsaber duel at home, my dad would put on the Darth Vader voice changer helmet and holds the red lightsaber to pretend to be Darth Vader, I will then team up with my little brother Hugo and fight against my dad. It all sounds very silly but it was really good fun especially when my dad chases us. Would you like to play another role in a Star Wars film? Definitely, or better still, Pendra Siliu: A Star Wars Story. Mark, can you share any projects coming up for Ivy? Movies: Maleficent 2 (2020), Cordelia (2019). Runway Model for London Fashion Week in September. 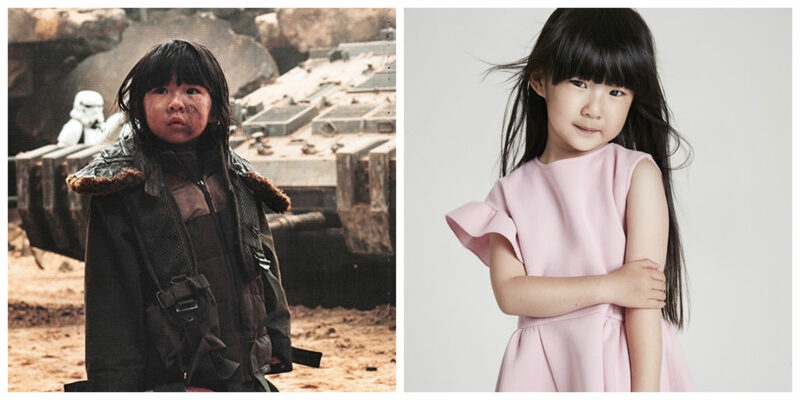 Ivy will also be flying to Spain for a Kinder Chocolate TV Commercial later this month. You can follow Ivy’s acting career on Twitter here and Instagram here. Here’s Ivy’s scene in Rogue One. Her character Pendra shows up about a minute into this video.